The Standing Conference of Orthodox Bishops in America (SCOBA) issued a statement on June 25, 2009 on Disability and Communion. Very well done. It is a word from my Leaders, the Shepherds of the flock of true worship. It is the WORD to my word. Persons with disabilities comprise the largest minority group in the United States, with almost 20% of the population facing disability in one form or another. Disability affects people of all backgrounds, nations and races, of both genders and any age. A disability stems from an impairment that is either congenital, or the result of disease, injury, or the developmental and aging processes. Disability is a daily and, in many ways, a natural occurrence. We are all touched by disability in the form of illness or injury or difficulty at some point in our lives. Since we all hold the treasure of God’s life in fragile earthen vessels (see 2 Cor. 4:7), each of us is vulnerable to disability, whether by circumstance, by genes, by disease, by accident, or by age. Such disability might include chronic disease, vision or hearing impairment. However, for some people, such a physical, mental, sensory or emotional impairment substantially limits their daily activities. One of the most repeated phrases in our liturgy is the Trinitarian nature of our God: “Father, Son, and Holy Spirit.” The God we worship is characterized and defined by communion or interdependence, not exclusion or independence. In our pursuit, then of a model response to disability concerns, we affirm a God of love and hospitality, in the manner of Abraham and Sarah welcoming the three angels (Gen. 18) reflecting the unity of the Trinitarian God. In this respect, the Church, too, is called to become the image of the Trinity, a unity of persons in communion, a place where everyone is welcomed. Humanity – created in the image and likeness of God (Gen. 1.26) and comprising an icon of Trinitarian communion – is enriched and defined by the unique gifts and differences of every person. No one is created perfect, and all of us strive toward perfection in the crucified Jesus Christ, who alone is the perfect “reflection of God’s glory and the exact imprint of God’s very being” (Heb. 1.3) and the complete image of man – fully divine and fully human. Therefore, it is only in the Body of Christ, as a corporate image, that each person becomes an equal and indispensable member. Every member, those with as well as those without disabilities, bring specific and special talents to the Church. At the same time, we need one another in order for our gifts to be revealed. Thus, in the Church, we learn to honor and to complement one another. However, such completion or perfection (theosis) is always a constant striving, never fully accomplished in this life. For, “just as the body is one and has many members … so it is with Christ.” (1 Cor. 12.12) Indeed, “the parts of the body which seem to be weaker are indispensable.” (1 Cor. 12.22) There are two points that we should notice in St. Paul’s words: first, that certain parts may “seem” weaker, but in fact are not actually weaker; second, that weakness is not the characteristic of an individual but of the entire Church. This means that, when people with disabilities are in any way excluded from our parish life, then the entire body is incomplete. “We all bear one another’s burdens in order to fulfill the law of Christ.” (Gal. 6.2) When St. Paul speaks of the weak, he is continuing a long biblical tradition that God chooses the vulnerable for the sake of bringing wholeness and healing to the entire community. We often forget that the application of the word “membership” to persons is of profoundly Christian origin, and it is only in the Church that it assumes full and authentic meaning. St. Paul implies that members of the Church resemble organs of a body, essentially different from and yet essentially complementary to one another. Membership differs from mere inclusion in the collective or political sense. We are not a full community without one another. If we exclude or overlook one member, then we do not simply reduce the community; in fact, we inflict injury on the very structure of the Church. Ultimately, the way that we embrace people with disabilities reflects the way that we perceive the incarnate and crucified Word of God. As Christians, the God we worship is characterized and defined by assuming flesh and lying utterly powerless on the Cross. Christ came to “reconcile and tear down the middle wall of separation.” (Eph. 2.14) As disciples of Christ, we are called to consider society’s walls, as well as the walls which we set up and which separate us from our neighbor. For these all too human walls contradict the ministry of Christ, which is a ministry of reconciliation and healing. It is unfortunate that, in our day, people with disabilities still encounter such walls, whether through physical barriers or through prejudicial attitudes; indeed, it is unconscionable that our parishes often tolerate or perhaps even contribute to such exclusionary conditions. The healing miracles of Jesus, which are recounted in the Gospels, are primarily concerned with the reconciliation of persons to their communities, rather than merely the cure of physiological conditions. Jesus did not distinguish between physical healing, social restoration and the forgiveness of sins. For example, the man with leprosy is offered the opportunity to return to his community (see Mark 1.40-45), while the paralytic is forgiven his sins (see Mark 2.1-12). Forgiveness of sins implies removing the stigma imposed by the prevailing culture, where disability was associated with sin. Thus, disability is principally a social issue, while healing is the removal of social barriers. We often reduce the significance and scope of forgiveness to guilt and redemption. Yet, the Greek word for forgiveness (synchoresis) implies much more than this, pointing to a sense of sharing and fitting together within community. Furthermore, all of us require such forgiveness and reconciliation within the community. Perhaps this broader interpretation of forgiveness will help us disassociate disability from sin, guilt and physical healing. What is called for is a sense of solidarity with all members of the Church, rather than an expectation of similarity with worldly images and stereotypes, whereby people emphasize either cure or acceptance of a condition. The Church’s role is to embrace the reality of humanity in all of its depth and breadth, including the reality of people with disabilities who are often excluded, rejected, or abandoned. For, “truly, anything that we do for one of my brothers and sisters, however, insignificant, we do it for Him.” (Mt. 25.40) The integration of persons with disabilities within the Church gives testimony to God’s love as expressed by His disciples and is a model for society where disabled people suffer from humiliation and marginalization. Therefore, welcoming every baptized Orthodox Christian to full parish membership makes the community whole and enriches all of us as God desires. Indeed, embracing persons with disabilities is a proclamation of the Gospel message. For, we are all called to “welcome one another, even as Christ has welcomed us.” (Rom. 15.7) All of us, with and without disability, are invited by God to a full life of faith and ministry, including worship, leadership, education, and service. The most evident expression of the community is the common worship of the congregation. 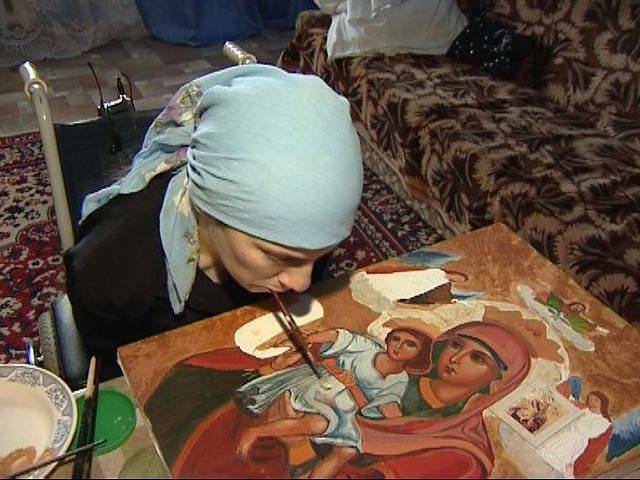 Orthodox worship is rich in color, sound, smell and movement, appealing to all senses and all persons. Therefore, we should examine especially carefully, then, whether we consider ways in which people with disabilities are encouraged to participate in our services, in our choirs, or in the many non-verbal elements of our worship. More fundamentally, we should examine whether the entrances to our buildings and the pathway to receiving Holy Communion are accessible to all members of the Church. Moreover, we should examine whether our liturgical and pastoral services are welcoming to those among us with challenges in movement, hearing, sight, or speech. Furthermore, to feel truly welcome in our parishes, persons with disabilities must not be excluded from leadership roles. We should explore ways of involving people with disabilities in administration by inviting them to serve on committees, by offering assistance in transportation, or perhaps even by changing the venue of a particular meeting. We should consider every appropriate opportunity and dignified manner with which to include every member of the community in liturgical occasions and catechetical classes. No one should be excluded from the manifold aspects of the church’s education (whether children, adults, or the elderly) or the community’s pastoral ministry (such as visitations and fellowship). There should also be provision in our seminaries for training and informing future clergy regarding aspects of inclusion for people with disabilities. Responding to issues of disability reflects the willingness to respond to the vulnerability of life itself. An inclusive paradigm of ministry is a crucial step in dispelling misconceptions and assumptions regarding disability, while rendering all areas of parish life accessible and possible to persons with disabilities. The Americans with Disabilities Act (ADA), signed into law in 1990, was the first comprehensive civil rights legislation to protect people with disabilities. Yet, beyond legal obligation and civil conduct, responding to and including people with disabilities are not options for us as Orthodox Christians. This includes, for example, providing curb cuts, adequate ramps, sufficient handicapped parking, wide doors and aisles to accommodate wheelchairs. It is our personal and collective obligation to strive for the transfiguration of all people and all things in the heavenly vision of unity. Humbly learning the proper language and appropriate behavior is part and parcel of our vocation as children of the living God and disciples of the risen Lord. It involves identifying and increasing the visibility of people with disabilities – those using canes, walkers, wheelchairs or service dogs. The key in relating to people with disabilities is always communion and openness, not mere compassion or pity. The only rules are sincere love and genuine respect. We are called to look at the person and to remember that the disability is only a part of the whole person. Thus, the first and most valuable gift that any community can offer a person with disability is recognition, rather than rejection. Our mission is, in humble cooperation with the Holy Spirit, to render the Church as a whole body, a human reflection of Trinitarian communion, an earthly image of the heavenly kingdom. Let it be so among us.